This exciting keyboard by Logitech is our latest tech obsession. The exciting journey between techonolgy and design has reached even greater heights. The K780 Multi-Device wireless Keyboard is the result from a collaboration between Feiz Design Studio and Logitech. 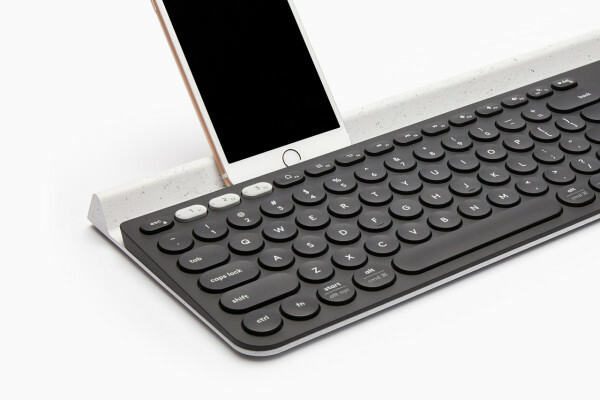 This product caught our attention for its innovative design that interlocks two elements – the keyboard and the device-cradle – but it will be a tech-lover’s favorite for its usability too. Being wireless, you can link it to various devices such as a smartphone, a tablet or PC, switching easily between them. The K780 functions keys and shortcuts that work with Macs and PCs, iOS, Android and Windows 10 devices. Due to its design and construction, this keyboard allows to type silently. The concave and convex circular keys are ergonomic and make the targeting of the buttons much easier. The K780 has an integrated rubber cradle that is super useful to hold your mobile device in an angle. The keyboard is powered by two AAA batteries, but it comes with a the power-saving idle mode that will make the batteries last up until 24-months.